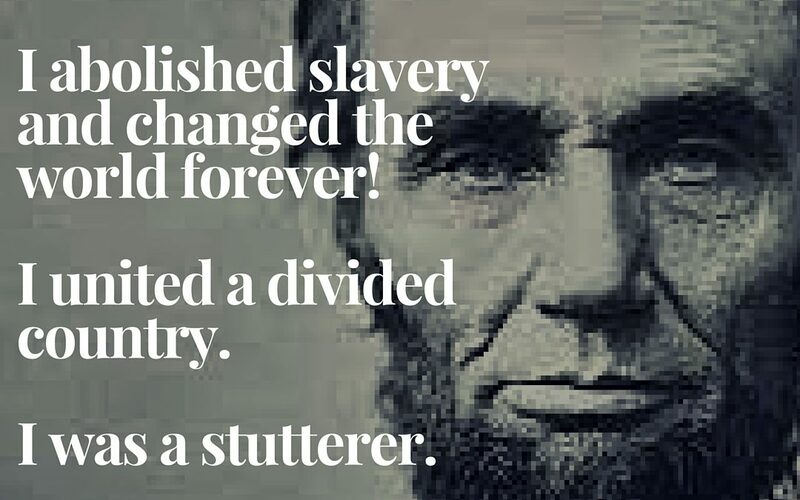 Abraham Lincoln - Famous for Stuttering? My name is Abraham Lincoln. I abolished slavery in the United States. My most famous speech is engraved on the walls of a memorial and memorized by school children. You know Abraham Lincoln was the President of the United States. You might even know that he was the 16th President. You’ve heard he had a reputation for honesty. But did you know that he stuttered? Lincoln was born into a poor family. His mother died when he was young. He only had 12 months of formal schooling in his life, but he didn’t let the lack of formal education or his stuttering stand in the way of changing the world. Lincoln loved language, he was an avid reader, and he was determined. Lincoln practiced his speaking skills with sermons and stories told to friends and family as a form of self-therapy. When he was first elected to state office in 1834 it was on the power of his personality and not his rhetoric. In the early 19th century, “defective articulation” was many times considered to be a sign of low intelligence. Lincoln didn’t let that perception of his stop him; and knew that to be a successful lawyer and legislator he would need to overcome this barrier. During Lincoln’s time, speech pathology was not recognized as it is today. However the art of elocution became fashionable. Elocutionists worked with professionals to improve their speech. At the same time it became quite trendy to attend lyceums. These venues were where people gathered to listen and give speeches on a wide variety of topics. Some elocutionists included communication disorders within their scope of work. The timing of this movement coincided with the rise of Lincoln’s career. It was destiny. Lincoln hired the services of a teacher in 1846 and at the age of 37 worked very long and hard hours to overcome his speech disorder. All of this while just a freshman in Congress. Lincoln lost the Senate election to Douglas, but his ability to speak clearly and with passion was well established during their debates. In fact, the Republican Party nominated Lincoln to be their Presidential candidate on the strength of his skill as an orator. Lincoln went on to make an indelible imprint on history. Now when you think of Lincoln, think of how a young, highly motivated man was able to overcome his stuttering to become one of the most accomplished orators in US history. This Famous Friday profile was brought to you by New Beginnings Pediatric Speech Therapy Services. New Beginnings specializes in childhood speech therapy services. Don’t let speech and language issues stand in the way of your child’s success. Contact New Beginnings at (915) 855-0601 for a free phone consultation or to get answers to your questions.